Kile Clear View Caps: Now Available for Claas Lexion Terratrac and Grimme Harvesters! 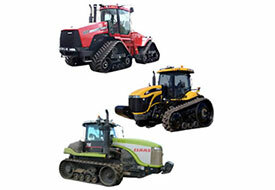 New: Kile Clear View Caps to fit John Deere 9RX Series – Available Now! (a) Unless otherwise agreed in writing these are the only conditions upon which Eurotrack Limited (registered number 05363638), whose registered office is at Summerhill House, 1 Sculthorpe Road, Fakenham, Norfolk, NR21 9HA. Eurotrack Limited (“Eurotrack”) agrees to supply products (“Products”) to any person placing an order (“Customer”) with Eurotrack. Any contract between the Customer and Eurotrack (the “Contract”) however formed shall include these Terms and Conditions. (a) An order to supply Products (an “Order”) shall, unless otherwise agreed in writing, be placed whenever a request for the supply of Products is received by Eurotrack and recorded/logged in writing by one of Eurotrack’s authorised representatives. It shall be the responsibility of the Customer to satisfy itself that its request has been communicated to a Eurotrack authorised representative. Eurotrack’s authorised representative(s) shall NOT be required to verify enquires beyond or otherwise investigate the bona fides of the request to supply Products but shall be entitled to assume and contract on the basis that request is made by a person with lawful and actual authority to contractually bind the Customer in accordance with the terms set out herein or otherwise agreed in writing. (b) Any description or specification of the Products in Eurotrack’s catalogues, price lists, order forms, invoices and similar documents is given by way of identification only and use of such description shall not mean that any supply or sale covered by these Terms and Conditions is a sale by description. (c) The Customer has no right under any circumstances to cancel the contract or any instalment or order of Products without prior written consent of Eurotrack. If Eurotrack gives such consent (and it shall not be obliged to) Eurotrack may make it a condition of such consent that the Customer pays such compensation as Eurotrack may reasonably require. Nothing in this clause shall be construed as implying that Eurotrack conducts business on a sale or return basis. (a) Prices given by Eurotrack at the time of the order are those then prevailing. If before delivery of the Products there occurs an increase in the costs to Eurotrack of supplying those Products which have not yet been delivered, the price payable may be subject to amendment provided that Eurotrack shall use its best endeavours to notify the Customer of such amendment as soon as is reasonably practicable. (b) Prices are given on an ex works basis. (c) All prices are exclusive of VAT and any similar taxes. All such taxes are payable by the Customer at the rates in force at the tax point date. (d) All prices are exclusive of all costs or charges in relation to packaging, loading, transport, unloading, carriage and insurance; all of which amounts the Customer shall pay in addition when it is due to pay for the Products. (e) The Customer shall be responsible for obtaining any necessary import licences, certificates of origin or other requisite documents, and paying all applicable customs duties and taxes in respect of the supply of the Products. (a) Eurotrack’s invoices are payable by the Customer in Pounds Sterling in full prior to delivery of the Products, unless otherwise agreed by Eurotrack in writing (in which case payment in full shall be made within 30 days from the date of the invoice). Interest will be charged on any overdue invoice until it is paid at the rate of 4% per annum above the base rate of LloydsTSB Bank PLC in London. Such interest will accrue on a daily basis and be payable after as well as before judgement. The Customer’s attention is drawn, in particular, to paragraph 10 below. (a) All Products shall be supplied on an ex works basis. (b) Risk in the Products shall pass to the Customer once the Customer has been notified that the Products are available for collection from Eurotrack’s premises or any other reasonable location nominated by Eurotrack. Once risk has passed, the Customer is responsible for all loss, damage or deterioration to the Products. (c) Where Eurotrack agrees to arrange for transport and insurance of the Products to the Customer, Eurotrack does so as agent for the Customer and the Customer shall reimburse to Eurotrack its full costs on an indemnity basis. (iv) maintain the Products in satisfactory condition and keep them insured on Eurotrack’s behalf for their full price against all risks to the reasonable satisfaction of Eurotrack. On reasonable request the Customer shall produce the policy of insurance to Eurotrack. (c) The Customer may not resell the Products before ownership has passed to it. (d) Eurotrack reserves the right to re-possess any Products in respect of which payment is overdue and thereafter to re-sell such Products and for this purpose the Customer grants Eurotrack, its agents and employees an irrevocable licence at any time to enter any premises where the Products are or may be stored with or without vehicles during normal business hours. (e) Eurotrack shall be entitled to recover payment for the Products notwithstanding that ownership of any of the Products has not passed from Eurotrack. (a) While Eurotrack will use its reasonable endeavours to supply Products at the time requested by the Customer, time of delivery shall not be of the essence of the contract. (b) Stated dates or times for delivery are approximate only. Eurotrack may at its sole discretion deliver ordered Products in instalments, in part or otherwise. 1(iii) if the Customer becomes insolvent or bankrupt, or suffers any writ, claim or other proceeding to be taken for debt, or being a corporate body has a receiver appointed or passes a resolution for winding up, or a competent court makes an order to that effect, or being an individual or partnership makes a composition or arrangement with his or their creditors, or has a receiving order made against him or them. (b) On termination under the foregoing provisions, the price of all Products sold and delivered by Eurotrack to the Customer or to a carrier for delivery to the Customer and all other sums outstanding from the Customer to Eurotrack on any account whatsoever shall immediately become due and payable notwithstanding any credit period previously agreed. (a) Unless otherwise agreed the Products are supplied in accordance with the manufacturer’s standard specifications from time to time. Products delivered will be to the specification current at the time of delivery, which may have been changed from that at the time of the Order. In the event that the manufacturer’s specification for the Products changes between the time of the Order and the time of delivery, Eurotrack reserves the right to change specifications or descriptions of the Products provided that it uses its best endeavours to notify the Customer of such a change as soon as is reasonably practicable. (b) Eurotrack will not be liable in respect of any loss or damage caused by, or resulting from, any variation for any reason in the manufacturer’s specification or technical data. (c) Where a Customer is unable to specify a part number for any Product, Eurotrack will use reasonable care and skill in supplying Products which are fit for the Customer’s purpose as disclosed by the Order. (e) If any Product supplied by Eurotrack under paragraph 9(c) above is not fit for purpose as certified by the Fitter in writing before installation of the Product, then the Customer may return the Product to Eurotrack unused at its own expense to arrive at Eurotrack’s premises within 28 days from the original date of delivery of that Product. (f) In the event of a Product being returned under the terms of paragraph 9(e), Eurotrack will refund the price paid by the Customer. (a) Eurotrack warrants that it has title to or licence to supply all the Products to the Customer. (b) Subject to these Terms and Conditions, Eurotrack warrants to the Customer that all Products supplied will at the time of delivery be of satisfactory quality and will comply with any specification agreed for them under paragraph 9(a) save for reasonable deviations therefrom. (ii) at Eurotrack’s option, repayment of the price (where this has been paid). (iii) return the Products in question to Eurotrack. (e) Subject to paragraph 10(h), Eurotrack’s liability under these Terms and Conditions shall be limited to £20,000 (twenty thousand pounds). (f) Regardless of anything to the contrary in these Terms and Conditions, in no event shall Eurotrack be liable to the Customer for special, indirect or consequential damage including loss of profits in connection with the use of the Products. (g) The Customer agrees that the allocation of risk and the limits of Eurotrack’s liabilities under these Terms and Conditions is reflected in the price to be paid by it and recognises that Products cannot be tested in every possible situation and thus Eurotrack does not warrant that the operation of the Products will be uninterrupted or error free and it is not within Eurotrack’s control how and for what purpose the Products are used by the Customer. (iii) death and personal injury caused by the negligence of Eurotrack, its employees, contractors or agents. (a) The headings in these terms are for ease of reference only and shall not affect its interpretation or construction. (b) All rights and remedies available to Eurotrack under these terms shall be in addition to, and not to the exclusion of its other legal rights. (c) In the event of any of these terms or any part of them being judged illegal or unenforceable for any reason, the continuation in full force and effect of the remainder of them shall not be prejudiced. (d) Neither party shall be liable to the other for any delay in or failure to perform its obligations hereunder (other than the payment of money) where such delay or failure results from any force majeure or any other cause beyond its reasonable control. (e) Any documents or notices given hereunder by either party to the other must be in writing and may be delivered personally or by post and in the case of post will be deemed to have been given on the second day after posting. Documents or notices to Eurotrack shall be delivered or sent to the address at the head of these Terms and Conditions. (f) Any failure by Eurotrack to enforce any of the contract terms and conditions shall not be construed as a waiver of any of Eurotrack’s right hereunder. (g) These terms and conditions shall be governed and construed in accordance with English law and the parties irrevocably consent to the jurisdiction of the English courts. (a) The Contract (incorporating these Terms and Conditions) comprises the entire understanding of the parties in respect of the matters contained or referred to in it and there are no promises, terms, conditions or obligations oral or written express or implied other than those contained herein. (b) The Customer irrevocably and unconditionally waives any right it may have to claim damages or rescind the Contract for any misrepresentation not expressly contained herein or for any breach of any warranty not expressly contained herein unless the misrepresentation or warranty was made fraudulently.